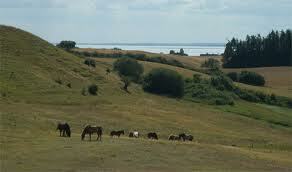 Mols Bjerge is a national park which is located in southern Jutland, Denmark and was established in August of 2009. Centrally located in the park are the Mols hills. Visitors to the park can visit the town of Ebeltoft, the many forests, an 18th century manor and the ruins of a castle from the 14th century. 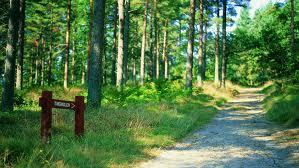 There are trails for hikers and bikers. One can wander over rolling hills, explore bogs, pastures, beach meadows, the coastal area and the sea. Visitors can see playful otters at Stubbe and Lange Lakes which are located in the north of the park. On the west side are the Kalos marshes and forests which are full of flora and fauns including rare insects which make their home in the trees. Within the park are many Bronze Age sites which have visible mounds that can be explored. You can take a look at the Kalo Castle ruins dating back to the Middle Ages. The market town of Ebeltoft offers attractions like the Jutland Frigate and Glass Museum. 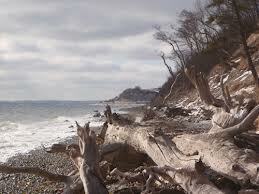 It also has great beaches. Not only are there trails for hiking and places throughout the park for cycling but along the coastline you can also find swimming beaches and great fishing spots. Wildlife includes hare, deer, fox, and lizard there are also birds of prey. There are lovely oak forests to explore as well.